I promised I would show you my latest blog design. I designed this just for Jax Frey. Ron Carrier from Uptown Acorn referred her to me. Again, I thank Ron., whom I also designed his blog. 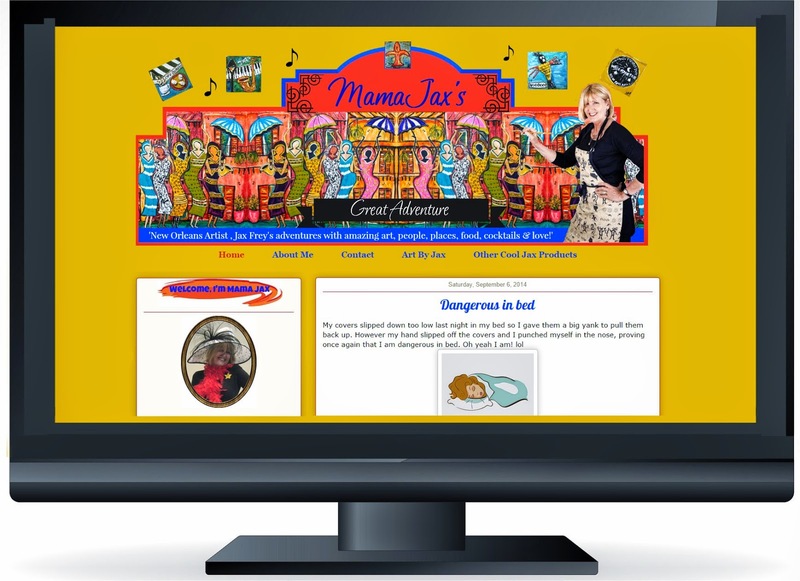 Mama Jax is a very talented artist from New Orleans. Jax loves to create colorful, super-textured paintings of all things New Orleans. Check out her wonderful art here. Look for my line of New Orleans mini paintings and be on the lookout for my Gumbeaux Sistahs paintings too. I love those chicks! I'm writing this blog because I have a plan to make the next few years as remarkable as possible for myself. Some of you know that I'm a certified Life Coach and, as such, I believe we should have a plan for our lives. So here's what my plan loosely looks like for now - End of 2014 - 2015 will be -A year of Living Large in New Orleans, - 2016 - A year of Giving Back & Compassion, - 2017 - A year of the Walk-About, - 2018 - A year of Seeking Grace and Knowledge. I'll be exploring these themes in this blog and having as much fun as humanly possible! Now about you - come along on this journey with me! Please feel free to share your experiences along these themes too. Thanks! Recently I made some Apple - Oatmeal Muffins. These are so cute. They look like apples. 1. Heat oven to 350°F. Line cupcake pan with 12 red liners. In large bowl, mix first 4 ingredients; stir in apple. 2. Add flour, oats, cinnamon and 1/2 cup sugar. With fork, stir until moistened and just blended. Divide batter evenly among cupcake liners in pan. Bake 15 min. or until done. Let cool completely. 3. In bowl, mix 2 Tbs. orange juice, 1⁄2 tsp. orange zest, remaining sugar and food coloring as desired to create thick red glaze, adding additional juice or sugar as needed. Spoon over cupcake tops or dip tops in glaze to coat. Insert cinnamon sticks in center of cupcakes. Shape or cut gummy slices into leaves; add to cupcakes. Let sit 15 min. or until glaze is set. 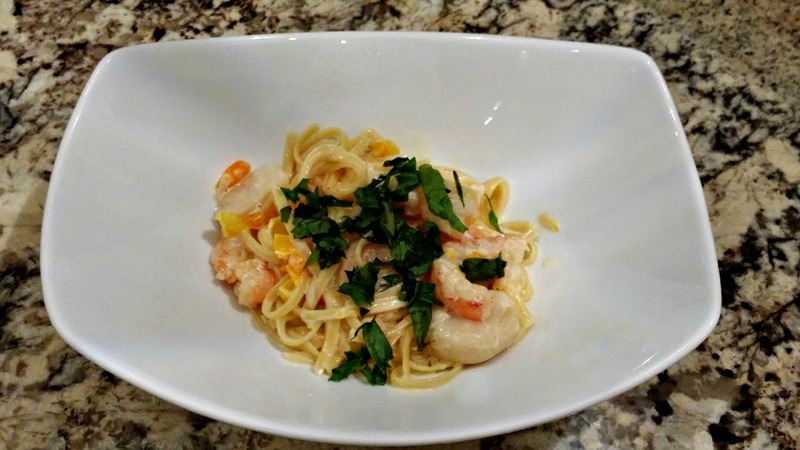 If you like spicy, you will love this rich cream sauce with a kick! 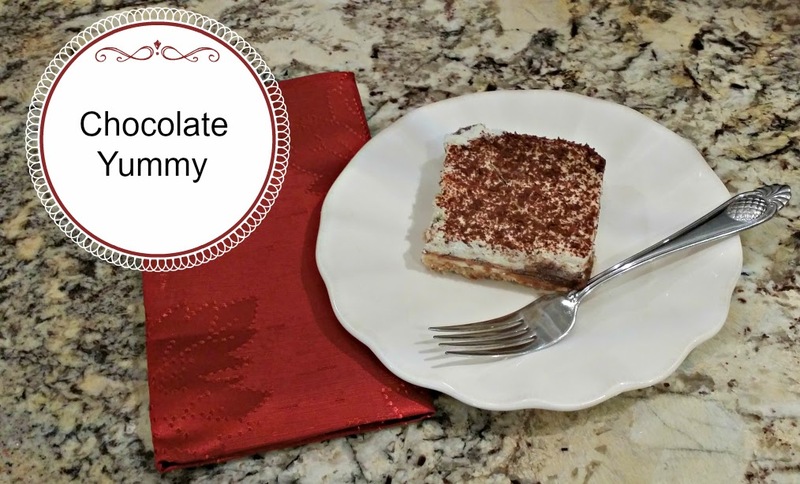 Chocolate Yummy is a well know dessert from New Orleans. I made this dessert for that Seascape dinner we had recently. You can see that tablescape here. Chef Donald Link of New Orleans restaurants Cochon and Herbsaint, shared this recipe as part of a special Mardi Gras celebration he created for Epicurious. 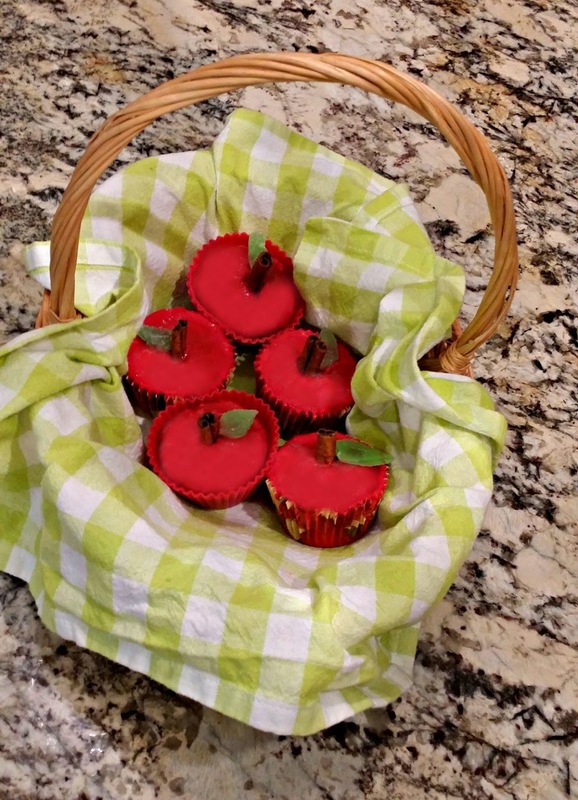 Those apple muffins are so cute and bet they taste yummy too. and for your nice comments, so appreciated. Cute new blog face, Linda! And a referral from Ron! I just LOVE Ron! Linda, such a beautiful table in blue, and everything looks really great. Wonderful job on the blog design! Your Tablescape was beautiful and the desserts look so yummy! Have a wonderful weekend. I get your blog posts a bit late, but I so enjoy watching what you are creating. 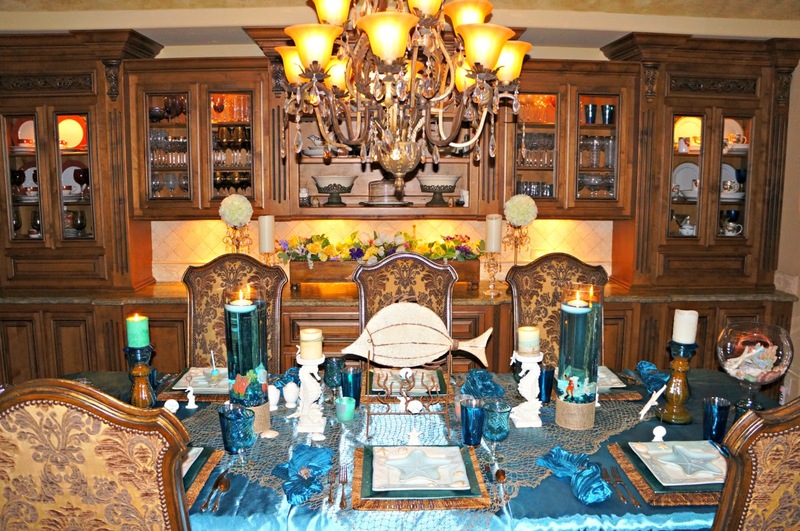 Happiness is the feeling I see in your blog creations and in your table scapes. All for love....all for the love of family and friends. 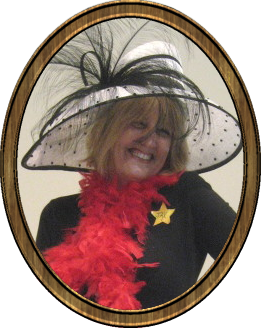 You are such a talented lady, Miss Linda! Beautiful blog design, yummy sweets and scrumptious savouries - thanks for sharing!! Hi Linda! You did a great job on her blog. Never heard of choc yummy, but it does look, YUMMY! Love her blog design! I look forward to learning more about her. Now....I am absolutely starving here at a bit after 11 p.m. These food photos have me drooling. Looks delicious!!! Thank you SO much for sharing this delightful post at Foodie Friday! What a fun blog design for what appears to be a very fun blogger! Great job. It was so nice to hear from you. Great design and the recipe sounds yummy. Thanks for sharing and thanks for dropping by for a visit. Happy New Week. Hi Linda! Oh, you are so talented and I love the designs you made for her! So fun and I'm sure it will get her some attention! You are so smart! Love the new snap of you - you're a beautiful lady - inside and out! Love the looks of those little muffins and the table with all the blue is just gorgeous! Thanks for popping in to see me and hope you're doing well. Linda, the blog you designed looks great! I love your apple muffins! And those chocolate yummies, while I've never had one, I think I need to try one soon! Hmmm, I posted last week here but it seems my comment did not make it! Awwhh, well, I am in tech hell these days, lol. I love this design, Linda, and your choice of colours are fabulous. Your attention to detail truly blows my mind and Mamma Jax has got one gorgeous blog now. The Cajun dish from Emeril looks so delicious. I am going to cook it soon. It has all my favourite ingredients. I have never heard of chocolate yummy but I want some! Your menu sounds perfect for the wedding! lol.